Silahkan klik tulisan atau gambar untuk lanjut membaca As Hurricane Florence Makes Landfall, Trump Tweets Support to First Responders. WASHINGTON, LELEMUKU.COM - As Hurricane Florence makes landfall in the Carolinas, U.S. President Donald Trump Friday tweeted his support for the Federal Emergency Management Agency (FEMA), first responders and law enforcement, stating that they are doing an “incredible job." Trump’s tweets reiterated remarks he made during a Congressional Medal of Honor event at the White House late Wednesday, when he stressed the safety of the American people is his “absolute highest priority," and that his administration is sparing no expense. 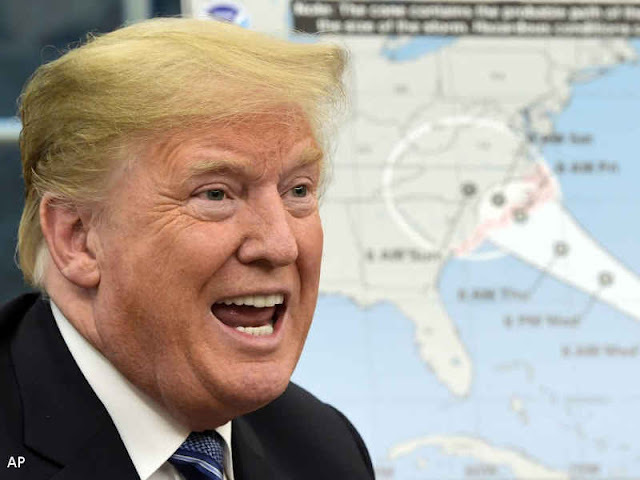 Trump was to be briefed by officials on Florence emergency preparedness at the White House Situation Room later on Friday. In a statement, the White House said the administration has put preparations in place to assist states and local governments, including deploying personnel from FEMA, the Department of Health and Human Services, and the U.S. Coast Guard. The U.S. Army Corps of Engineers has also been deployed to set up temporary emergency power teams. On Thursday, Trump faced criticism for disputing the official death toll in Puerto Rico from Hurricanes Maria and Irma that hit last year. On Twitter he said “3000 people did not die in the two hurricanes that hit Puerto Rico." An independent study concluded the death toll from Hurricane Maria was nearly 3,000. Trump also alleged on Twitter, without evidence, that opposition Democratic Party members inflated the death toll. At a news conference to discuss hurricane response and recovery early Friday, House Democratic Leader Nancy Pelosi responded to Trump’s tweet by saying, “Think about that, pray over that. Think of the people who are affected by that”. She added that the attitude from the administration is unacceptable and that “we have a moral obligation to do better, not only to finish the job of Puerto Rico and the Virgin Islands, but to prevent the same type of inadequate response from ever happening again”. Hurricane Florence arrived on North Carolina's Atlantic coast early Friday, making landfall near the town of Wrightsville Beach, with maximum sustained winds of 90 kilometers per hour and gusts up to 150 kilometers per hour.